Your Quick Draw capo will operate flawlessly after one initial adjustment. It remains ready to slide into position for the fastest key changes possible even as you are playing! Your Quick Draw capo need never be removed! 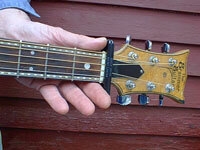 Push it easily above the nut for storage, and to the first or second fret to help hold new strings during replacement. It stays with your instrument, so you'll always know where it is.